Tips For Saving Money for a Home Purchase! Mortgage interest rates reamain at near historic low levels and home prices also remain lower than they were prior to the recession. It's a great time to purchase a home, but it takes money these days to make home ownership a reality. Even with 3.5% down FHA loans and a limited number of 100% mortgage loan programs, there are closing costs involved. The following article from Realty Times gives some great ideas on how you can save money, so that you can take advantage of the unique home purchase environement that we have today. Interest rates remain historically low and even though housing prices are increasing in many areas, the market still offers lots of opportunities to become a homeowner. But what's holding many back is saving enough for a downpayment. Reaching any goal requires dedication to that goal and a mindset that enables you to sacrifice to achieve what you desire. Often that's easier said than done. However, if you analyze your spending and lifestyle habits you can determine where you can conserve to create enough of a reserve to comfortably buy a home without feeling totally deprived. Here are six tips that can help you put away $50 to hundreds of dollars each month. Start with a fresh sheet of paper or a digital document that you can refer to frequently. Keeping it fresh on your mind will help you achieve your goals. 1. Write down what you owe versus what you earn. Get clear about how much is coming in and how much is going out. This alone will help you see where money is being spent and how much is being spent on things that could be cut back or cut out completely. 2. Consider getting rid of recurring expenses for services you don't really use or you use infrequently. Maybe it's a gym membership that's adding up to more than a $1,000 for the year; but you really only use it three or four times a month. That makes no sense. Get rid of it and find a workout buddy and a free place to exercise. Or it could be an audio or video membership that's going to waste. Sure, it might be $20 a month but over a year, that adds up. Try listening to podcasts. They're free! Some podcasters are very entertaining and their podcasts can be excellent sources of information and resources for business and personal development. 3. Stop the coffee run each morning. Do the math. That fancy coffee drink can cost $40 a week, especially if you add a bakery treat. Your waistline and your wallet will take a beating. 4. Cut back on eating out or dine out early. Make more meals at home. This will allow you to take leftovers for lunch the next day. When you do decide to eat out, dine out earlier in the day. You can often take advantage of eating the same great meal at a less expensive price by ordering from the happy hour menu. These days, lots of people find saving and living lean to be hip and cool. They'll be happy to join you for an earlier meal. 5. Start a side job. If you're working a full-time job, evaluate what your skill set is and see if you can freelance. I spoke with a client recently who had a "day job" and was earning additional income. He was already up about $50,000 from his side job of selling auto parts. It may take a bit to figure out where and how you can earn your side income, but it's worth exploring. This could even turn into a full-time job. Lots of people are making money working from home using the Internet. Explore your options and see how you can generate some extra cash each month. 6. Use momentum to pay back your debt. Work hard to pay down cards with the highest interest rate first. As one card is paid off, transfer the money you were paying on that card to another card. By combining whatever you were paying on the paid off card to another balance that you're paying down, you're giving it some momentum and you'll get that next card paid down even faster. Remember that reducing your spending is critical to having what you want. So don't add to your debt. Once you save for your deposit, you'll want to make sure that you also save enough to have a cash reserve for emergency repairs and any unexpected crisis that might occur. Also, make sure that you make this process a good experience rather than a painful one. Keep your eye on the goal and understand that the decisions you make today will impact your future and your opportunity to become a homeowner. On Friday, Jan. 18, the Oregon Board of Higher Education said yes to a proposed $5 million renovation for Autzen Stadium on the campus of the University of Oregon, and will be funded primarily by long-time U of O benefactor and co-founder of Nike, Phil Knight and his capital contracting company, Phit Too, LLC. The plan calls for improvements to the stadium's accessibility features, addressing problems like the human bottleneck on the north side created by the pre-game and post-game rush to and from the parking lot. To accomplish this lofty goal, as well as to bring the structure in line with the current Americans with Disabilities Act's requirements, the approved recommendations include removing current ramps on the stadium berm's north face, re-grading a section of it and replacing it with a series of new and better ramps. In addition, a 20-foot concrete switchback and new stairs will be added in order to facilitate the efficient and safe flow of fan foot traffic. Once the facelift on the north side is completed (making the steep hill and its inherent difficulties fade into oblivion like visiting football teams at the home of the Ducks), fans of all ages, able-bodied or otherwise, will have easy, free-flowing access to their seats. But these are not the only big changes woven into the details of the renovation project. It will also include several aesthetic improvements. As the finishing touches are made on the soon-to-be berm-less north side of the stadium, crews will start trucking in more than 30 live trees. They will arrive already mature and stretching 35 to 40 feet tall. The varieties will include Douglas fir, giant sequoia, coast redwood, incense cedar, Canadian hemlock and western red cedar. To keep these trees company on non-game days, contractors will carve two gullies for streams to bubble and splash around their roots. Complete with moss-blanketed basalt stones, these man-made waterways will enhance this pleasant and beautiful nature scene. According to the Register-Guard, the $5 million bottom line for these new renovations is twice the amount of money ($2.5 million) it took to complete all of the construction on Autzen Stadium back in 1967, its inaugural year. In 2002, the stadium underwent a major, $90 million renovation that added 12,000 seats and 32 skyboxes, increasing the stadium's maximum seating capacity to 54,000. It was a terrific, unprecedented 2012 football season for the Oregon Ducks – and it even impacts North Gilham real estate in Eugene, believe it or not. That’s because Coach Chip Kelly, a resident of the North Gilham neighborhood, is moving to Philadelphia to become the head coach of the NFL’s Eagles so his home will soon be on the market. But enough real estate talk for the moment – let’s recap the season and take a look at some of the real estate covered by the Ducks in 2012, this time measured in yards and touchdowns instead of square feet. The Ducks played in their fourth straight BCS bowl game and conquered every opponent on the schedule, except pesky Stanford. Oregon ended the season by handily defeating #5 Kansas State in the Fiesta Bowl, showing the Wildcats the unstoppable speed that toppled so many opponents. Overall, the Ducks posted 12 wins and racked up incredible offensive numbers. When redshirt freshman Marcus Mariota was named starting quarterback, who could have foreseen that Mariota would be the Pac-12’s best signal caller and 7th in passing efficiency nationally? Evidently, departing coach Kelly and offensive coordinator Mark Helfrich – now Head Coach Helfrich, by the way – knew what they had. Still, Mariota’s incredible composure all year was impressive. In the opening game, against Arkansas State, Marcus Mariota leads the Duck offense to 7 consecutive touchdowns. In the Pac-12 opener against Arizona – historically a close matchup – the Ducks destroy the Wildcats, 49-0. Against Washington State the Ducks again win big (51-26) behind Kenjon Barner’s 195-yard, 3-touchdown performance. This was heartening for Barner, who was knocked out cold in Pullman two years ago, sustaining a bad concussion and missing a chunk of the season. The next week against Washington, the Ducks won 52-21, once again completely dismantling a Husky team that thought it could hang with the Ducks. Bad dogs. The Ducks won an amazing score-fest in Los Angeles against USC, defeating the Trojans 62-51. Senior Kenjon Barner had a career game, running for 321 yards and three TD’s. Behind Mariota’s mind boggling 6 touchdown passes, Oregon cleaned Cal’s clock in Berkeley, 59-17. Against Oregon State, the Ducks again cruised, this time beating their arch rival 48-24 in Corvallis. In the Fiesta Bowl vs. Kansas State – a team that Oregon had figured to play for the national championship until both teams lost on the same weekend – human highlight DeAnthony Thomas ran back the opening kickoff 94 yards and the Ducks never looked back, winning 35-17. Oregon finished the season ranked #2 for only the second time in school history, matching the accomplishment of the Joey Harrington-led 2001 squad. In 2013, the Ducks look loaded on offense, with 17 of the top 22 players returning. On defense, the Ducks have to replace outstanding linebackers Michael Clay and Kiko Alonso, but have a strong cast of returning players. New coach Helfrich is innovative and well liked by the players, and Oregon will likely be ranked in the top 5 to start the year. Go Ducks! Since 1894, the University of Oregon’s football program has been wowing fans, while providing plenty of life-long memories for Oregon Ducks supporters. Today, the high-flying Ducks are one of the fastest and most talented teams in college football, as they continually put up winning seasons and make prestigious bowl appearances. Their biggest achievement came last season, as the Ducks won all of their regular season games (12-0) and made their first ever appearance in the BCS National Championship Game. Although the game was lost in the final seconds to Auburn by a score of 22-19, the Ducks still were able to inspire a national audience by displaying their tenacity, resilience and heart. This year the Ducks look to recreate the success of the past against a slew of tough foes in the Pacific-12 Conference. Oregon got off to a rough start, losing its season opener against LSU 40-27, but bounced back with a 69-20 win over Nevada. With 11 regular season games left, there is still plenty of time to make a run at another conference championship and bowl bid. LaMichael James, one of the notable stars and leaders of this year’s squad, is coming off an incredible 2010 campaign. Last year, he rushed for nearly 1,700 yards and scored 22 touchdowns, winning the Doak Walker Award as the nation’s best running back and finishing third in voting for the Heisman Trophy. 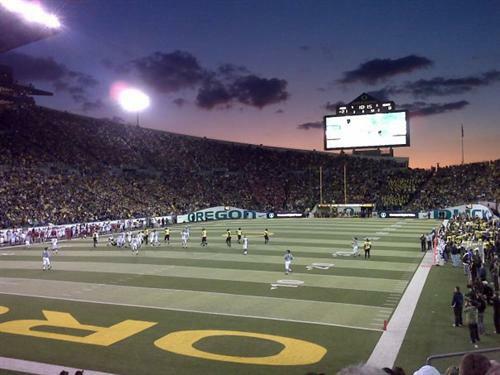 Autzen Stadium, located in Eugene, Oregon, and its almost 60,000 Ducks fans were roaring on September 10th as Oregon hosted its first home game of the season. Autzen, one of the loudest and most exciting places to watch a college football game, may make it hard for fans to hear their friends next to them, but they will be able to hear plenty of unified GO DUCKS chants from the faithful in yellow and green. Founded in 1876, the University of Oregon began with just one building (Deady Hall), 155 students, and five faculty members. The university is now the second oldest and second largest public research institution in the state of Oregon, and is the state’s sole member of the elite Association of American Universities, a group of 60 top research universities across North America. 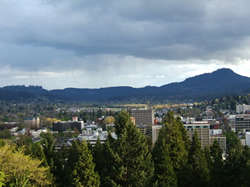 Located in lush Eugene, the campus is in a perfect spot between the Pacific Ocean and the Cascade Mountains which provides a wide variety of activities for the diverse population at the University of Oregon. Eugene offers all the benefits of a small city, but with easy access to all types of outdoor entertainment. The university is divided up into eight schools and colleges including the School of Architecture and Allied Arts, College of Arts and Sciences, Charles H. Lundquist College of Business, College of Education, Robert D. Clark Honors College, School of Journalism and Communication, School of Law, and the School of Music and Dance. The most popular majors on campus are business administration, psychology, journalism, and political science. Students at the University of Oregon are very involved both on campus and in the community. There are more than 250 student clubs on campus ranging from swing dancing to marketing. With two museums located directly on campus and several others around Eugene, arts and culture play a major role in student life. One major example is the School of Music’s internationally known Oregon Bach Festival, a choral/orchestral festival the Wall Street Journal has called “one of the world’s leading music festivals.” The Bach Festival’s long list of plaudits includes a Grammy award won in 2001. Also important to University of Oregon students are its athletic teams; in the 2010 football season, the Ducks made it all the way to the National Championship game only to take home second place. Along with its accomplished football team, the University of Oregon boasts the nation’s most famous track and field venue, Hayward Field, which is the home of its outstanding men’s and women’s track and field teams. The U of O also offers men’s and women’s basketball, cross country, golf and tennis teams, plus men’s baseball, and women’s softball, soccer, lacrosse, volleyball, and acrobatics & tumbling. Today, more than 23,000 students from all 50 states, the District of Columbia, three U.S. territories, and 85 countries call the University of Oregon home. February 2011 Market In Eugene Area Declines! The statistics are in and yes the Real Estate market in the Eugene and Springfield area continues to change. Here is what the month of February looked like in comparison to February of 2010. Closed home sales were down 10.1% from February of 2010 and Pending home sales fell 19.9% for the same time period. The number of new home listings hitting the market also declined by 27.5% over the same period in 2010. The average sales price dropped by 15.4% from February of 2010. The better news is that Closed sales were actually up from January of this year by 4.6% and Pending sales were up by 14.4%. New listings were off by 12.1% from February of last year. The average sales price of homes in the Eugene and Springfield area dropped from $197,800 in January 2011 to $179,400 in February of 2011. This is a decline of 9.3% in one month. There was 11.9 months of active home inventory in February of 2011 and this is in comparison to 10.9 months in February of 2010. The average time it took for a home to sell in February of 2011 was 170 days and this compares to 136 days in February of 2010. Wow! This weekend was a true taste of Summer! We will take all that we can get. Congratulations to the University of Oregon Men's and Women's track teams for winning the Pac 10 championships over the weekend. The statistics are in for the April 2010 Real Estate market in the Eugene and Springfield area. April of 2010 saw closed sales increase by a whopping 67.6% over April of 2009. Pending sales were also up and were 48.9% higher than the previous April. New listings hitting the market were up as well and rose by 29.9%. April closed sales were also up over March closed sales by 12.7%. The inventory of homes on the market for sale stood at 7.3 months and this was down considerably from 10.5 months in April of 2009. The Median home price continues to drop and was down by 4.2% from April of last year and now stands at $199,000. The average time it now takes a home to sell is 109 days, which was down from 143 days in April of 2009. The question now is, how much of this market upswing was created by the tax credits? Now that the tax credits are gone, we will get an indication. Low interest rates and continuing lower home prices are also adding to increased sales activity. 2010 Real Estate market in Eugene and Springfield area looks similar to 2009! Don't look for any huge changes in our local Real Estate market for 2010. Most likely home prices will continue their steady slow decline over the next year. Home inventories should remain somewhat scarce in the $250,000 range and below and upper end priced homes will remain quite slow on the market. Most demand for housing will be in the first time buyer segment. Look for mortgage interest rates to remain low for most of the year. Yes, it looks like more of the same. Home foreclosures could spike in 2010. Look for heavier numbers of foreclosed homes and short sales to hit the market as ARM loan rollovers pick up steam. The rollovers of these loans could mean double or even triple the payments amounts for many homeowners with little chnce of getting out from under them. One thing that I am hearing a great deal as of late from people thinking of selling their home is, "I think that I will just wait until Spring or Summer when the market is better to place my home on the market". If you are needing to sell your home, don't fall into this costly trap. Your home very well may be worth less in the Spring than it is right now and even less yet by Summer. If our market continues to decline in value as predicted then waiting to sell your home could be a very big mistake. Eugene and Springfield Real Estate market remains tough! Congratulations to both the University of Oregon Ducks and the Oregon State University Beavers. Both teams won their football games on Saturday and will now square off on December 3 to battle each other for the Pac 10 championship and the Rose Bowl game. It's exciting stuff for the state of Oregon. The inventory of homes for sale in the sub $250,000 range continues to decline. This price range is where the buyer activity has been and currently is. There just are not enough homes in this price range to meet demand at this time. Many of the homes that are on the market in this price range are also either bank owned properties or with sellers needing to do short sales. For sellers who have homes in this price range it is good news as the market has changed to being a sellers market in these lower price ranges. The market remains sluggish over $300,000 and is almost non-existant when you get to the $700,000 range and above. Don't look for any changes in the upper end housing market soon. In fact this market will continue to be extremely soft and values may continue to decline for another year or two. If you are going to need to sell a in the upper end price ranges, you are better off to do it now than to have the false expectation that waiting until Spring may bring a better market and higher sale price for your home. Just the opposite will most likely be true. Remember, if you are interested in knowing your homes current market value you can log onto the web site www.forhomesellers-nonSmartZip.com and get a FREE approximate home value analysis by e-mail. (Service only good for Lane County, Oregon).